The email to Marvin strategy is always on. 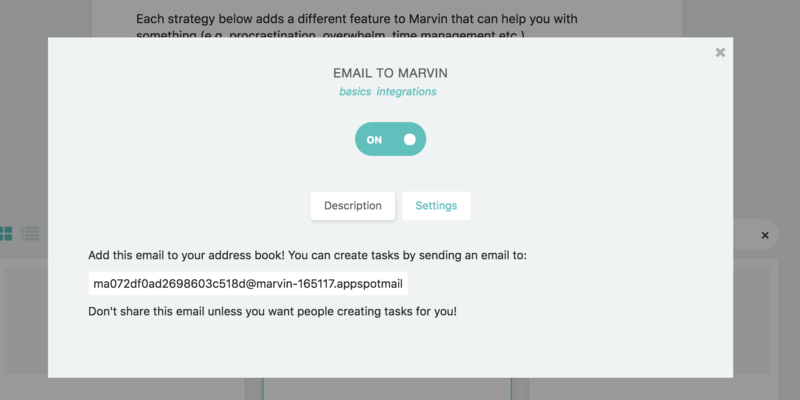 It allows you send/forward emails to your Marvin account which will automatically be turned into a task. To figure out the address of your Marvin account, go to the strategy settings. There you will find your unique Marvin email address. The subject line of the email will be turned into the task title. And the email body will be stored in the task note. If you want to give the task additional data, such as a due date, time estimate, labels or file it in the correct category of project you an simply include that information in the shortcut format in the subject line. So for example to add a label called @urgent to a task add "@urgent" to the subject line of the email before sending it. By default, sending an email to Marvin creates a task. If you want to create a project instead, add p: or project: at the very beginning of the subject line. What happens to email attachments? Marvin does not know how to deal with email attachments yet as you can't currently have files attached to tasks. This is planned in the future, but not a high priority at the moment.